A: The posture for receiving Communion has varied over time and still varies among the several rites of the Church. It also depends on the frequency of Communion, the distribution of one or both species, and the manner of distribution of both species. Regarding the place for the faithful’s reception of Communion, the early Latin tradition favored approaching the altar and, indeed, most later solutions maintained some relationship with the altar even though it was physically in a different place. In some areas, where there were many communicants the clergy would come to the places of the faithful. When the sanctuary was separated from the main body of the church by gates, these were left open at the time of Communion so that the faithful could enter and receive at a side altar. This practice was curtailed from the early ninth century on. After this, the sanctuary began to be surrounded by a high wall and the faithful would approach a transept altar erected outside the screen. In some places such as North Africa people would approach a rail. This rail was higher than later altar rails and would reach chest level. Therefore, until this time the custom was to receive standing. This is still the practice of most Eastern Churches for whom knelling is not a common liturgical posture. From the ninth century on, the practice of receiving only the host and directly on the tongue became the norm. Likewise, between the 11th and 16th centuries, the custom of receiving the Lord’s Body while kneeling gradually gained ascendancy in the Latin rite. Around the 13th century it became customary in some places to spread a cloth, held by two ministers, for kneeling communicants. Later on, in the 16th century it was common to place the cloth on a table or bench located between the nave and the sanctuary. Since this proved quite convenient for administering Communion they gradually evolved into the fixed wooden, metal or stone altar rails which were practically universal from the 17th century until recently. Although the Second Vatican Council did not call for the removal of altar rails, in fact, they have been removed in many places. The practice of receiving Communion standing rather than kneeling and on the hand rather than on the tongue is also far more common. The more frequent distribution of Communion under both species, taking the Precious Blood directly from the chalice, has also influenced this change of posture. The liturgical norms still allow for kneeling, although allowing leeway to the bishops’ conference to emit other norms but not to disallow kneeling. Thus, the General Instruction of the Roman Missal, No. 160, has a slightly different text in the United States and in other English-speaking countries. 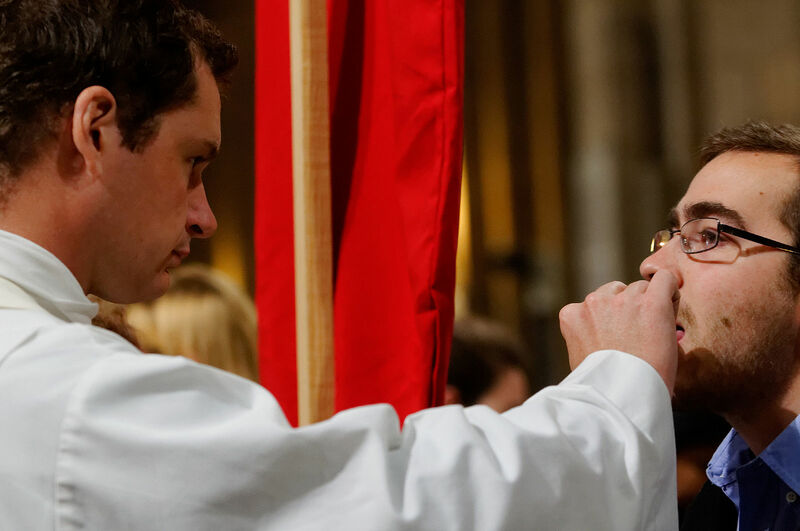 “… The norm for reception of Holy Communion in the dioceses of the United States is standing. Communicants should not be denied Holy Communion because they kneel. Rather, such instances should be addressed pastorally, by providing the faithful with proper catechesis on the reasons for this norm. Have You Heard of How the Church Saved the Macuxis, Indigenous of Brazil?